In the applet below, the purple angle's measure can be changed by adjusting the slider. In addition, the BIG WHITE POINTS can be moved anywhere you'd like. Construct a ray with endpoint C that serves as the other side of this new purple angle you've just constructed. Now, use the purple slider to change the size of the 2 congruent purple angles. Be sure to also change the locations of the BIG WHITE POINTS. What seems to be true about the yellow ray and the orange ray? 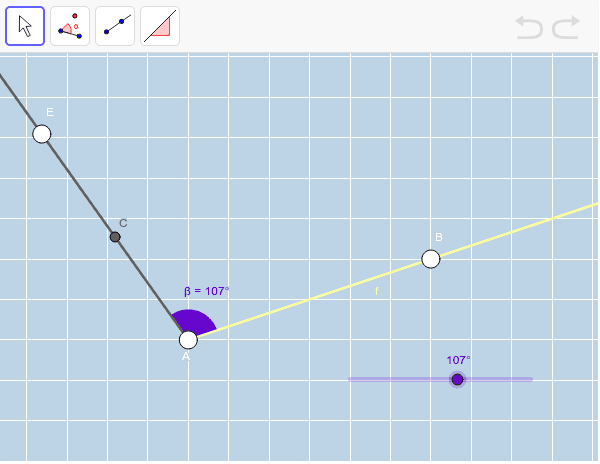 Use GeoGebra to show that your claim (response to question 3) is true! Explain how your work shows your assertion is true. Write what you've just observed as a conditional (if-then) statement. How does this conditional statement relate to the conditional statement we've discovered in our previous class?